Weight training initially targets hypertrophy & general conditioning. It is usually performed 3 times per week. Interestingly when athletes lift in sets of 8-10 they stay much fresher in terms of their nervous system than later in the year when they are lifting more intensely with sets of 3-4. This means that during the conditioning phase it is much easier to perform quality running without it being effected by flatness from the weight training sessions. Late in the phase sets should decrease from maybe 3 sets of 10 to 3 sets of 8. Athletes should lift upward fast & down slow, they should not lift to the same tempo as a body builder even though the aim of this phase is to attain some muscular hypertrophy. Plyometrics in this phase should aim to develop power with the longer contact varieties. Standing start bounding e.g. 4 alternate leg bounds & a jump into a sandpit can be performed. Standing long jumps & standing triple jumps can also be performed. Hill training can be performed over distances of 60-100m and some can involve alternate leg bounding. e.g. run 60m bound 20m. Athletes should perform two relaxed tempo sessions on grass per week & total between 1200m-2200m in each session. It is essential to keep tempo sessions slow so that they do not effect the quality of training the next day. This means running 100m reps not within 4s of maximum effort. A good tempo session may be something like 4 sets of 6 x 60m with a set of pushups & crunches before each rep. Athletes can rest after each run for 30-60s then start the exercises & have 5min between sets. These sessions build good general conditioning & are a much better alternative for sprinters than jogging for 20min. Speed development sessions initially focus on improving performance over 30m from a 3 point start. Often what happens is the athletes will find that improvements in strength, bounding & 30m times will happen concurrently throughout the phase. During this phase weight training changes to smaller sets e.g. 3-5 sets of 3-6 reps to target the development of maximum strength. This move can easily negatively effect the quality of running that can be performed the next day. It is ideal to be able to do fast track sessions in the morning & then weight training straight afterward or later on in the same day. In this way it is easier to balance the recovery in the week to maintain quality in faster track sessions. Weights should be continued 3 times a week. Maximum speed work should expanded to include as well as the 30m runs longer distances of 40m, 50m & 60m. It is best to shift emphasis to 40m then to 50m then to 60m. In the second period the emphasis can start longer & be built up to include some 80m sprints. It is also a good idea to do some flying start runs of 15m to 30m or in & outs over longer distances. Speed sessions can be performed twice a week. It is important to aim to do only as many sprints as you can perform with quality at maximum effort. Make sure the athlete can back up from the session to the next one & still perform good quality. If the athlete is finding that they can’t back up for the next session do less reps , do the runs sub-maximally or do less weights. Balancing this area is a key problem when coaching sprinters. Plyometrics should progress toward varieties that have shorter duration ground contacts. A good way to do this is by performing running start bounding. e.g. 10m running start then 4 alternate leg bounds & a jump into a pit. They should continue to do longer contact bounding as well. Plyometrics should be done once a week. Hill training can be continued by decreased to once every 2 weeks. The hill session should be of less volume of shorter hills with some bounding e.g. 2 x 3 x 40m hills with run 20m then bound 20m these can be done like a tempo session with exercises in between sets. It is also a good idea at this stage to start getting used to some speed endurance on the track by doing just 2 fast relaxed 150m reps on the track after the hill session. This will make it easier to transition to more work on the flat in the next phase. Athletes should continue performing two simple tempo sessions on grass per week & total between 1200m-2200m in each session. - jump up onto a box with less than 30% of 1RM half squat. - stomping step ups with less than 30% of 1RM half squat. These are often done in a circuit type situation with some heavy ¼ squats includes for a contrast effect. Plyometrics should progress toward even quicker ground contacts. This is done with the performance of alternate leg speed bounding. These are done with a 10m running start and the aim is to get as much power into the track as quickly as possible e.g. taking the minimum number of strides to go 30m but also in a minimum time. The athlete needs to aim to strike the ground well underneath the body. Hill training is replaced with small volume speed endurance sessions e.g. 150m rest 8min 150min rest 8min 150m rest 2min 150m. 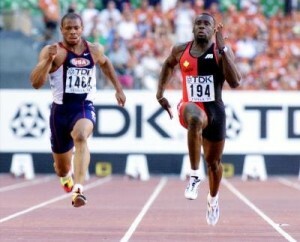 Maximum speed sessions should be expanded to include sprints of up to 60m. They can also start to include some over-speed either using a strong tailwind or an assistance system. These should be performed in small volumes that the athlete is used to using. Weight training sessions can be performed once a week with a very small amount of a complex lifts just to maintain strength e.g. power cleans as well as ¼ squats are performed to maintain strength. Plyometrics are stopped to enhance the athlete’s nervous system freshness. Maximum speed sessions are performed of the same variety as the power phase but the emphasis needs to be on racing. The 72hrs leading into the race need to be free of anything that could effect the nervous system on the day of the race. This means almost no intense high cadence training, plyometrics or heavy lifting. Tempo sessions once to twice a week with 800m-1600m in each. Similar to Conditioning A but the athlete should be entering this phase with higher levels of speed. They should do the smaller volume hill session from the strength phase e.g. e.g. 2 x 3 x 40m hills with run 20m then bound 20m with full recoveries and exercises between sets. Maximum Speed Development can be of a greater variety between distances of 20m & 60m. But most work should stay at 40m. Plyometrics should be of the long contact variety and can be combined in a session with block starts. Some alactic capacity speed sessions should be performed involving the use of larger numbers of short repetitions e.g. 3 x 4 x 60m at less than 95% effort with 2min between reps and 10min between sets. Similar to Strength A. The athlete should aim to become even stronger in this phase. Hills should be replaced in this phase with speed endurance sessions that are initially longer repetitions e.g. 2 x 300m but progress toward shorter repetitions of 100-150m. Maximum speed development should stay the same as in Conditioning B.
Plyometrics should progress toward quicker contacts. Plyometrics is speed bounds & some higher intensity plyometrics in low volumes e.g. over hurdle bounces e.g. in my squad an athlete did 6 x 2 plyo-hurdles at heights up to 107cm. Maximum speed work should increase in distance & could re-introduce over-speed. It is important to do block starts & reaction time practice during this period. Speed Endurance should focus on progressively shorter repetitions down to sessions like 2 sets of 2-3 sets of flying start 60m-80m runs with rests between of 3min and 20min between sets. Some competition but not so frequent that the training plan is disrupted. Mental & physical freshness for races is the highest priority. Gym once a week should focus on maintenance of strength with a small range of complex lifts. Speed sessions should focus on technical aspects or extra speed may be chased using over-speed methods but this is not a good time of year to sustain an injury. Speed Endurance should be enhanced from appropriate amounts of racing. Tempo sessions of 800m-1600m should be continued once to twice a week. - decreasing contact times of plyometric activities. - decreasing total volume of weights & aim finally for improvement in power. - extending the distance of sprints from blocks. - decreasing the distance of speed endurance. - decreasing the volume of relaxed tempo sessions. - introducing some over-speed when appropriate late in the preparation. - build confidence & mentally preparedness for racing with block starts, reaction drills etc.